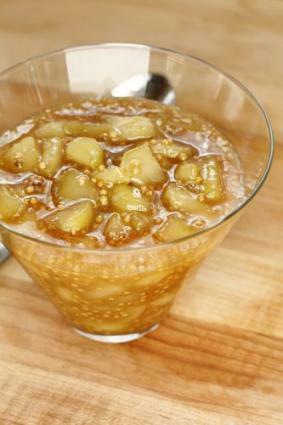 For a sweet and spicy condiment for poultry and pork dishes, try making a pear mostarda. Containing mustard seed and fresh pears simmered with sugar, mostarda also turns an ordinary sandwich into something memorable. A mostarda is a sweet and spicy mustard-fruit condiment used in much the same way chutney is. The traditional method of a mostarda recipe is to first candy fruits and then preserve them with mustard. You can use mustard seed or powder inside the cooked fruit reduction, or you can use prepared mustard in a separate syrup and pour it over the candied fruits. A mostarda is versatile, as many different fruits may be added; pear, apple, fig and quince are popular choices for the main fruit ingredient. It is also delicious when used as a single-fruit accompaniment. Modern adaptations include exotic fruits such as pineapple, dried mango and apricots. Fresh pears are good choices in a mostarda recipe as the flesh softens up nicely during simmering and the texture fits well with both meat entrées and cheese courses. Flavor a basic pear mostarda recipe with cayenne pepper for a little heat, or use a combination of brown and yellow mustard seeds. Recipes for a fruit mostarda are varied, and many use fresh pears as the main ingredient. D'Anjou pears are preferable because their flesh can remain firm while ripe, lowering the grittiness from the pears when cooked. However, you can use other varieties as well, such as the Williams, Bartlett pr Bosc varieties; use whatever pear is in abundance in your market. Serve this all-purpose condiment with roast meats and poultry dishes. Combine the pears, sugar, water, Dijon, mustard seed and honey in a saucepan. Bring to a low boil over medium-high heat, then reduce heat to medium. Simmer for about 20 to 25 minutes until the pears have softened and the liquid is reduced to a thick syrup. Cool to room temperature, then refrigerate for 24 hours before serving. Store in the refrigerator in an airtight container for up to a week. Pair this recipe with hard cheeses and cheese appetizers, as well as roasted meats. Place the pears and chopped apricots in a saucepan with the sugar, water, mustard seed, Dijon mustard and cayenne pepper. Bring the mixture to a low boil over medium-high heat. Reduce the heat to medium, and continue to simmer until the mixture has thickened and the pears and apricots have softened, about 20 to 25 minutes. Cool the condiment to room temperature, and place in the refrigerator in an airtight container for 24 hours before serving. Use within a week. If you don't want to go through the hassle of peeling and chopping pears for your own fresh mostarda, you can find prepared pear mostarda. Locally, the best place to look is at a special or gourmet food store. You also may find it in the ethnic-food aisle of your typical grocery store. If you are still coming up empty, try ordering it online from an Italian speciality foods merchant. Both Piazza Italian Market and Olio2Go offer reasonable pear mostardas.